TORONTO/ST JOHN'S, Newfoundland (Reuters) - Canada became the first industrialized nation to legalize recreational cannabis on Wednesday, but a lawful buzz will be hard to come by in its biggest cities like Toronto and Vancouver, where stores are not yet open. Marijuana enthusiasts in Newfoundland and Labrador, Canada's easternmost province, kicked off the first permitted sales at midnight. Over 100 people braved the cold and wind in the provincial capital St. John's, lining up outside a Tweed-branded store owned by Canopy. "I came out tonight to be the first person in Canada to purchase the first legal gram of recreational cannabis, to help see the end of prohibition in Canada finally," Power said. 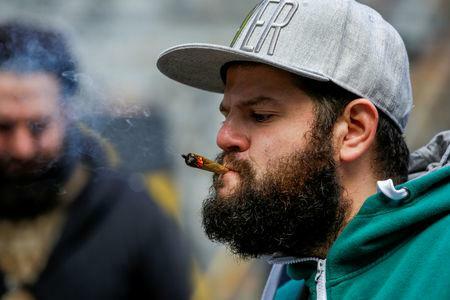 "There will be a lot of celebrations on the day, and it will almost all be with illegal cannabis" in some of Canada's biggest cities, said Brad Poulos, an instructor and cannabis business expert at Ryerson University in Toronto. "Recreational cannabis users in Canada . . . will just continue with their (existing) sources of supply until the legal system catches up." Despite the dearth of stores in Canada's biggest cities, consumers can buy legal marijuana online from provincial governments or licensed retailers, although delivery will take a few days. Shares of Canadian cannabis companies retreated on Wednesday after rallying in the run-up to legalization. Canopy Growth Corp and Aurora Cannabis, the world's two biggest cannabis producers, pulled back as much as 8.6 percent and 11.8 percent, respectively, early Wednesday after touching record intraday highs in the previous session. The Horizons Marijuana Life Sciences ETF, which also climbed to a record on Tuesday, slid as much as 8.2 percent. Countries around the world, many of which are just approving medical marijuana, are watching Canada's recreational legalization, which combines federal rules with varying provincial regulations. "The criminal prohibition that was in effect for a century in this country has failed our kids and our community," Bill Blair, minister of border security and organized crime reduction, told reporters. The change will bring "order to every aspect of the production, distribution and consumption of cannabis," he added. Ontario, home to Canada's most populous city, Toronto, will have no stores until April 2019 due to a change in the province's retail model by a new provincial government. "October 18th is going to look very much like October 16th, in many ways," Farnworth said. Separately, Public Safety Minister Ralph Goodale on Wednesday said the government would waive the fee and waiting period when people who have been convicted of possession of up to 30 grams of marijuana apply for pardons, after they've served their sentences. The legislation will be introduced by the end of the year, he said. Law enforcement of those driving under the influence of marijuana could be patchy. In August, Canada approved a device to detect levels of tetrahydrocannabinol (THC), the psychoactive element in cannabis, in a driver's oral fluids. "When the law changes on the 17th, we're not going to see a big change overnight," Palmer said. "Police aren't . . . champing at the bit to go out and start raiding stores."